The Pioneer Flight Museum held two workdays in October, the 13th and the 20th. The workday on the 13th was expected to be a smaller group and to get less done as Steve Freeman was unable to attend due to commitments elsewhere. 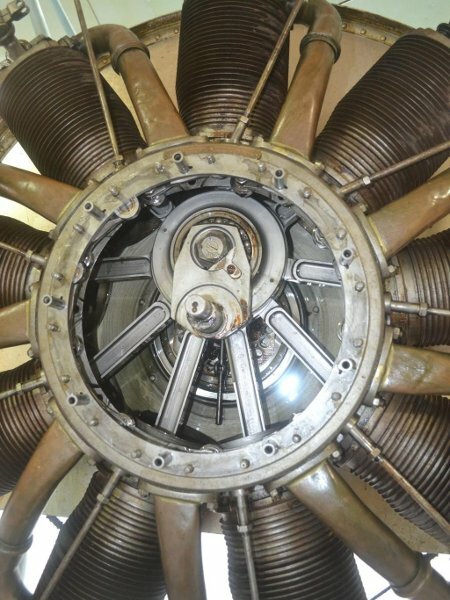 The workday on the 20th was the usual full-throttle affair, and quite interesting as the team essentially completed reassembling the OX-5 engine and did a deep dive into the Triplane's 80-hp Le Rhone rotary engine in an attempt to determine why it seemed to be vibrating so much. No work was done on the 13th; all the action took place on the 20th! Steve Richardson varnished T-1's longeron's rub strip as prep for installation while Jerry Stark finished prepping the T-2 cheek cowls for installation: drilling holes in the piano hinge segments and chamfering them for screws. Tom Miller and Steve Richardson worked on T-2's belly tail fairing which fits around the tail skid, checking cardboard templates and transferring the pattern to sturdier material for fit checks. After they were satisfied they had a good template they cut aluminum and began rough trimming / shaping the part. Tom, Steve and Jerry also worked on assembling the T-2 cockpit coaming, drilling holes and temporarily screwing the headrest fairing onto the cockpit coaming and support frame. Most of the work done on the 13th was prep work for delving into the engine. Dave Edgerly, Dave Orloff, and Ian Whitaker removed the prop and cowling from the Dr.I. Edgerly discovered that 3 of the 4 engine mounting bolts were about a half-turn loose - could be a source or result of the vibration Steve felt while operating the airplane. Ian patched the fabric on the Dr-1 wingtip repairing the damage incurred in Steve's last landing. On the 20th the goal of the day was to figure out why the engine was vibrating so much, even though it was running very strongly! Mike Craig and Don Craig checked the prop's balance and found everything was in order. Steve Freeman, Mike and Don started disassembling the front of the rotary engine to inspect the engine's internals, especially the crankshaft nose piece. Roger had already had a crank nose piece break while flying the Thomas-Morse. A damaged crank was the focus of the day! Since folks typically don't get much opportunity to see the internals of a rotary engine Steve, Mike and Don had quite an audience throughout the process! The crank's nose piece was found to be fine. A slightly bent push rod was discovered and replaced. An internal rocker arm was found to have some pitting on the roller so the unit was replaced. The bearings in the cam plate were cleaned out as they were stiff from castor oil varnish and fouled spark plugs were cleaned. Mike lubed all the bearings and moving parts in the Triplane's control system (i.e., ailerons, elevators and rudder) which lightened control system effort considerably! One tire was aired up. Mike also adjusted the tension on the air & fuel levers so they would not close due to vibration in flight. Once everything was buttoned up the crew attempted to start the engine - without success. Fuel was flowing but there was no ignition. Troubleshooting led to the brush protruding through the firewall not contacting the brass pads on the distributor ring. The unit seemed to have the carbon brush hung up in the mount, and the contact surfaces inside the mount were slightly corroded, so those parts were cleaned up. However, the engine still had no fire so troubleshooting moved further up the system. Evaluation of the magneto revealed pitting and corrosion on the points and a buildup of castor oil varnish inside the mag. Our mag is not Le Rhone OEM equipment and has a ventilation screen in the casing which was allowing castor oil fumes inside. It is possible that the magneto was able to fire the plugs with the brush hung up in the holder, but in its degraded condition the spark was weak and allowed the plugs to foul. Cameron Whitaker took the magneto home with him for further cleaning and sealing the casing. The magneto is due to be reinstalled in the airplane on the November 3rd work day! On the 13th the Canuck got her new tires! Kevin Monahan and Terry Bledsoe mounted the tubes & tires on the Canuck rims and Dave Edgerly and Dave Orloff reinstalled the wheels on the plane. Steve arrived in Kingsbury a few days before the workday on the 20th, and since the OX-5's cylinders were back from repair he called a couple of volunteers and they started reassembling the motor. Steve Freeman thinks they put those two cylinders on the motor about eight times! On, off, on, off, repeat as necessary! The best theory on why the exhaust valves were stuck is plain old lack of lubrication. On the 20th the engine was completely reassembled by Mike McCormick and Kevin Monahan. Intake manifolds, valve gear, water pipes and connections, and more were refitted to the engine. Work included making a variety of paper gaskets and properly torqueing down all nuts and bolts. Kevin Monahan was intent on finding "proper" spark plugs for the OX as the plugs that were in the motor didn't come anywhere close to reaching into the combustion chamber! However, the engine has seemed to run just fine on them though. Kevin reports that aside from adjusting valve lash and lubricating the valve stems the engine is complete and ready for reinstallation. Kevin thinks he'll have the work done prior to the November 3rd work day. On the 20th the Cub sure got a workout! Ian took up a total of three different passengers: Billy Cheshire, Cameron Whitaker and a visitor to the field. Billy and Ian toured the countryside with Billy pointing out to Ian his home. Later Ian and Cameron flew the Cub to a local airfield to refuel he airplane. When they returned to the field there were a couple of visitors and Ian took one of them up. He was an older gentleman who said he had flown for about 50 years, but he hadn't been up in ages! Steve took the other visitor up right afterward. At the end of the day eight people flew in the Cub yesterday! Some kind of record! Al Sumrall and Ian Whitaker, co-crew chiefs on "Old Pete", looked over the Pietenpol a little to see what else needed to be done before trying to start the engine. Their opinion is that it's not far from running. They need to change out the oil, clean out the gascolator and button up the engine's cowlings. Though uncomfortable, they reckon most of this work can be done in the hangar's back corner where the Pietenpol has been trapped for several months due to the Canuck's engine and wheel work! The last step would be putting a prop on it to try and start the motor. They'd like to "borrow" the Cub's prop (good luck with that, as much as that airplane has been flying!). Ian reports that he has someone looking at the Pietenpol's real prop, Ed Sterba, the craftsman who is making the Dormoy prop. Ed apparently doesn't think Old Pete's prop will be hard to fix! Ian expects to hear soon from Ed to discuss the possible prop repairs. On the 20th Team Vehicles swung into action continuing to prepare vehicles for the Fly-In. Kevin Monahan reports the guy who is doing the Triumph license plates is scheduled to finish the work late October. Kevin expects to have the Triumph fully operational for the Fly-In. Team Vehicles was pretty active on the 13th - Ian Whitaker, Steve Penaluna and Cameron Whitaker removed the wheels and took off the three tires from the French Ambulance. Al Sumrall and Cameron took the wheels to College station to have two tires mounted. Bruce Robertson and Cameron got Bruce's unpainted T started without too much trouble and Cameron drove it a bit. 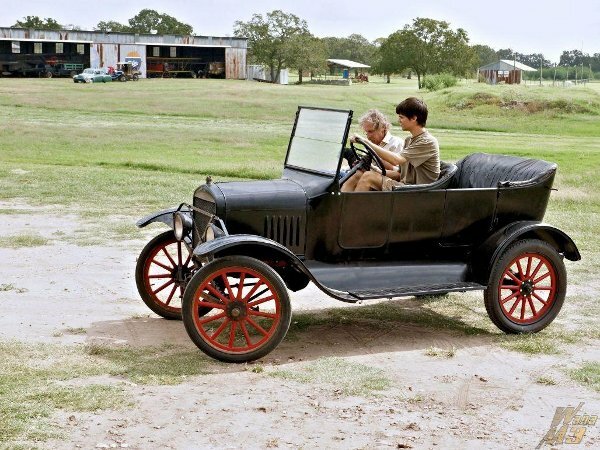 The Black Arts - Cameron Whitaker finished rebuilding and adjusting four Model T coils. The process was appropriate for Halloween! These old coils are encapsulated in a wooden box, and Cameron was boiling pitch in a pot on a burner to fill the wood box and seal the coil's components inside. He then had to adjust the coils to ensure they would work properly! Blue Racer - Lynn Howell continued working on the Blue Racer and had a breakthrough day! He disassembled the carb and discovered the float wasn't working as somewhere along the way a metal tab got bent down! Ten seconds later the float was fixed and the carb was working properly - at last! The vehicle still needs Cameron's special distributor linkage installed so the spark advance works properly. The way things are now the engine can be set up to run right but moving the spark advance messes everything up! TT - Steve Penaluna installed a new fuel cutoff valve which fixed the fuel leaks the vehicle was enduring. The TT, wrecker, and US Ambulance were started and run. Everyone was impressed when the US Ambulance started on the first pull of the crank! Due to work in the hangar the Signal Corps truck couldn't be moved out of the hangar, and the "French Ambulance" was still waiting on new tires. Prior to the work day on the 20th Charlotte eliminated the extra culvert that was clogged and cleared and repaired the main entrance culvert. These culverts up by FM-1104 cause water to copiously flow down across the roads on the property and leaves them badly washed out. This has been a problem for several years now! Charlotte also filled the ruts and smoothed the roads. Looks like she does great work because recent rains did not erode the roads any! There is also a plan afoot to lay crushed rock onto the road that goes to the pavilion from the front entrance. 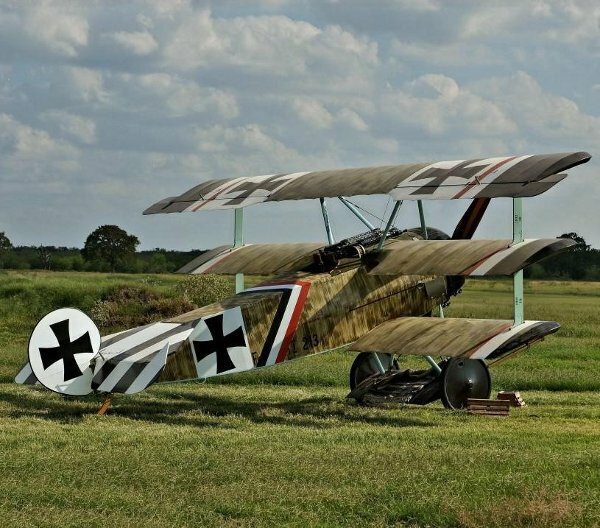 Cost will be split between the Museum, the R/C club, and Old Kingsbury Aerodrome. This work will not be attempted until after the Fall Fly-In! Terry Bledsoe, Dave Orloff, Tom Gaylord, and Billy Cheshire went into the jungle at the north end of the runway to clear "Wesatch" shrubs. Billy out-worked his three companions! The crew removed an overflowing pickup truck bed of Wesatch weed! Terry and Charlotte worked together to fill in some holes that wild hogs have recently rooted into the R/C flying field in front of the pavilion. Terry continued filling in some low spots up near the shop apron while clearing dirt from the south end of the berm to create more room for the Model Ts to parade during the Fly-In.